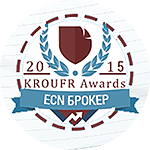 Less than a month passed from recognizing FreshForex as the best broker in Asia, and the company received another award — the best ECN broker award by KROUFR’s version. This award is given to brokers who have demonstrated best results in their work, and the winner was determined by an independent voting. The organization KROUFR (Commission on regulation of relations in financial markets) brings together market participants interested in the development of fair and open trading in Russia and the CIS. Thus, FreshForex company confirmed the compliance with the highest standards! What is special about our ECN account? - trading with any deposit amount. Evaluate the best conditions in ECN account with the best ECN broker!